Masoala National Park is the largest and one of the most esteemed national parks of Madagascar. It is located in the northeast in the province of Diégo-Suarez, Antsiranana; and covers a total area of 250 000 ha. Established in 1997, Masoala lies on the Masoala peninsula an exceptionally diverse wetland with a high biodiversity of plant and animal life. In 1985, Masoala National Park was designated as a natural World Heritage Site in attribute to its biodiversity and attractive marine ecosystems which harbor high diversity and abundance of rare species. Masoala National Park has a lowland tropical rainforest climate with high humidity widespread in this part of the island. It has an average temperature of 24°C. The driest part of the year in the Park area occurs from mid-September through December. The total annual rainfall seldom goes below 3000mm. Masoala is however prone to cyclones from the Indian Ocean. The flora in Masoala Park comprises several forest types ranging from primary forest to lush evergreen forests on the marshy bottom through the mangrove forests. Majority of these various vegetation species are more prevalent in the Big Island. It is also a home for several species of rare animals. 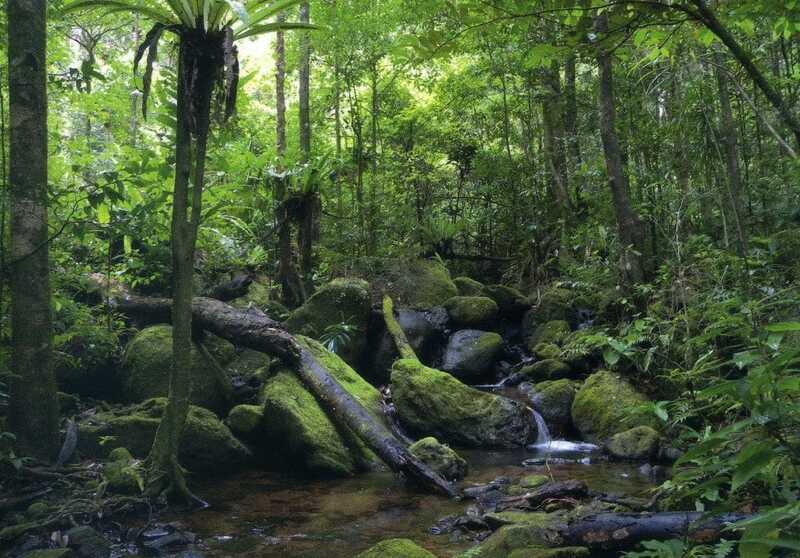 The Red-Ruffed Lemur, White-fronted Brown Lemur, Aye-aye, Greater hedgehog Tenrec, Fossa, Fanaloka, and Falanouc are found here in their natural habitat. However, despite the high number of animal species, wildlife in the park’s rainforests can be a challenge to spot. The aye-aye and the Red ruffed lemur highly classified as endangered by international conservationists is best spotted at night. There are also lots of insects. Chameleons particularly are relatively abundant with species such as the exceptionally colorful Furcifer and Brookezia more prominent. Endemic varieties of reptiles are also in abundance and the Uroplatus fimbriatus is the most amazing. Other marine wildlife available includes 44 species of frogs; Bats (14); Butterflies (135 species); 4 species of sea turtles; 97 species of bony fish; 2 species of whales; 2 species of dolphins; and 9 species of rodents. Masoala National Park is recognized as one of the prime bird watching destinations in Madagascar. Over 90 species of birds are found in the park including the Helmet Vanga, Swamp Francolin, White- Bellied Heron, Dalmatian Pelican, Spot-billed Pelican, Eastern Imperial, Grey Headed fish eagle, owls, and the serpent eagle. The serpent eagle is an extremely rare bird globally. A good population of them is found in northeast Madagascar. Each year from July to early September, hundreds of Humpback Whales visit the Antongil Bay during their long migration. The warm protected waters of the bay provide an ideal breeding and calving ground for these magnificent marine mammals. As the park is accessible only by a three-hour boat journey, the cyclone season (January to March) is best avoided. The easiest way to Masoala National Park is from the towns of Maroantsetra and Antalaha. Specially arranged boats are used for visitors coming from Maroantsetra. Safari travelers from Antalaha can also enter the park by road to Cap Est with bush taxis. Tourists can install their tents as the camping areas for tourists are promptly put in place. Campsites are available at Nosy Mangabe, Cap Est, Ambatolaidama, and each of the three marine parks. Cheap bungalows and visitor lodges are also available in most peninsula communities especially Antalaha and Maroantsetra. — Kayaking and snorkeling; these are popular activities in the marine parks of Ifaho in the East, Tampolo in the West and Ambodilaitry in the South. — Boat Rides and Diving; Marine diving is an impressive way to spot coral reefs, dolphins and rare fishes. However, park visitors are cautioned to be watchful where to dive and swim especially at Antongil which is notorious for sharks. — Game Drives; several long-day game drive trails are arranged at most campsites.